Each of the following kinds of heat pumps are available through the Heat Smart CNY program, in addition to air sealing and insulation. Click on the titles to dig into the details! Geothermal, or ground source heat pumps (GSHP), are electric appliances that provide heating and cooling by moving heat into a building (for heating) or out of a building (for cooling). Heat pumps do not create heat through burning fossil fuels or through electric resistance like conventional heating systems. Instead, they transfer heat from one place to another by using a refrigerant and heat exchanger that absorbs heat from one place and releases it into another. 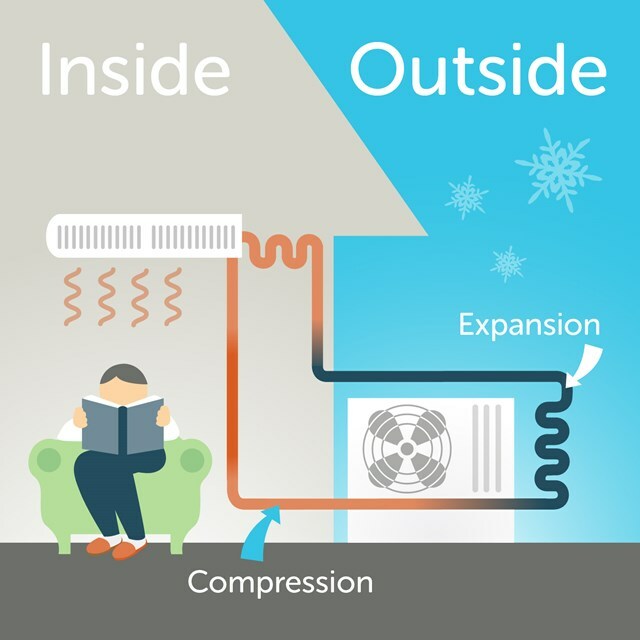 This is similar to the way that a refrigerator or air conditioner works except that heat pumps can move heat in either direction to provide heating or cooling. Geothermal heat pumps differ from air source heat pumps in that they use heat from the ground (as opposed to the outdoor air). They use piping and water underground to exchange heat and an indoor heat pump unit to take heat from the water and distribute it throughout your building. Air source heat pumps (ASHP) are electric appliances that provide heating by moving heat into a building and cooling by moving heat out of a building. Heat pumps do not create heat through burning fossil fuels or through electric resistance like conventional heating systems. Instead, they transfer heat from one place to another by using a refrigerant that absorbs heat from warmer air and moves the heat into space with colder air. This is similar to the way that a refrigerator or air conditioner works except that it can move heat in either direction to provide heating or cooling. Because it takes far less energy to move heat than it does to create heat, ASHPs are much more efficient: ASHPs offer 200-400+% heating efficiency compared to 80-90% for fossil fuels and less than 100% for traditional electric resistance heat—and can exceed the efficiency of window and central air conditioners as well. 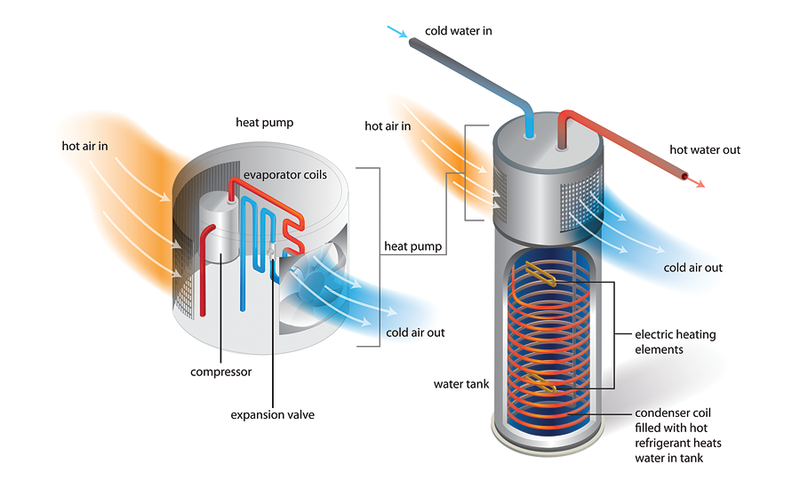 Heat pump water heaters (HPWH) are electric appliances that heat water by absorbing heat from the air and moving it into a storage tank, as opposed to generating heat through burning fossil fuels or resistance heating. A heat pump water heater is very much like a refrigerator running in reverse: instead of pushing heat out of the inside of the refrigerator into its surroundings, a heat pump water heater absorbs heat from surrounding air to heat water.